When Moise Mukanya wants to relax, he pulls out his CD player and turns on Congolese music. He remembers the tall mountains of his childhood in the province of South Kivu. He thinks of his hometown, Mulenge. He misses home, but he thanks God that he is in America, where his family is safe. Mukanya, 53, fled the Democratic Republic of Congo in 2004 to escape the ethnic conflict between Tutsis and Hutus that continues to this day. He and his oldest children sheltered at a U.N. refugee camp near Gatumba, just across the border in Burundi. But their “safe haven” was not safe. 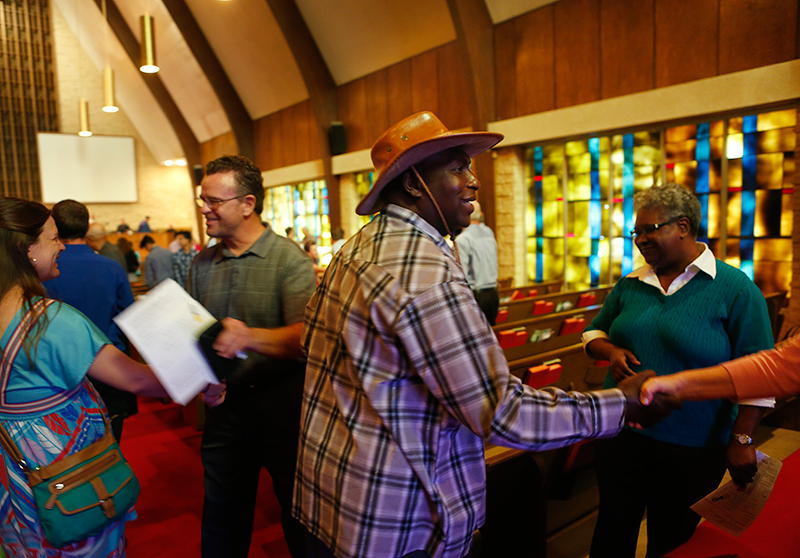 Moise Mukanya, center, greets fellow worshippers at Westbury UMC. The hundreds of refugees in the camp -- mostly ethnic Tutsis like Mukanya who had fled ethnic persecution in eastern Congo -- next heard gunfire. One of the rebels’ weapons was “so loud that it made its own echo,” a survivor said. The militia knew where the Congolese Tutsis lived within the camp. They moved methodically from tent to tent, survivors said; they sprayed the interiors with bullets and followed up with grenades to kill those the bullets had missed. The air was filled with the smell of burned flesh. After an hour, more than 150 refugees were dead, and another 100 were wounded. The rebels had killed precisely: almost every victim was a Congolese Tutsi. Though Mukanya was shot during the massacre, he managed to flee on foot with his sons -- Jeune, then 10, and Vianney, 9. His pregnant wife and his other children were elsewhere at the time, staying with relatives. After the attack, Mukanya’s family was moved to another refugee camp in Burundi’s interior. There, they waited. They waited as other Gatumba survivors were resettled abroad. They waited because someone, at some point, misplaced their identity documents, which are crucial for refugee resettlement applications. They had little in the way of food or clothing, Mukanya said. It was difficult to get medical care. He prayed every day for God to change their situation, and he kept worshipping amid the hardship. Mukanya’s family attended an Anglican church in the refugee camp. 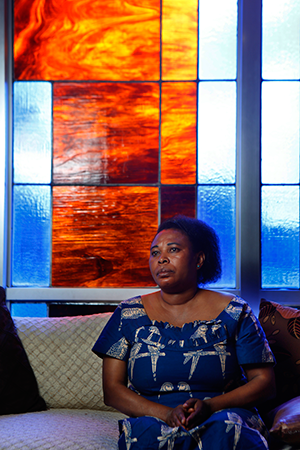 In 2013, almost nine years after the attack at Gatumba, “God answered our prayer.” Mukanya’s family was approved for permanent resettlement in the United States. That June, they stepped off the plane in Houston not knowing what they would find. Federal funds covered their rent and expenses for a few months, and their resettlement organization offered guidance, but they quickly had to pay their own way in an unfamiliar country immersed in an unfamiliar language. The U.S. refugee resettlement program emphasizes rapid employment and financial self-sufficiency -- which in practice means menial jobs and long hours. Mukanya’s wife, Grace, quickly started work as a hotel housekeeper. His son Jeune works 12-hour shifts stacking boxes on pallets; the other children are still in school. Because Mukanya never regained full mobility after being shot in the Gatumba attack he receives disability payments from the government. 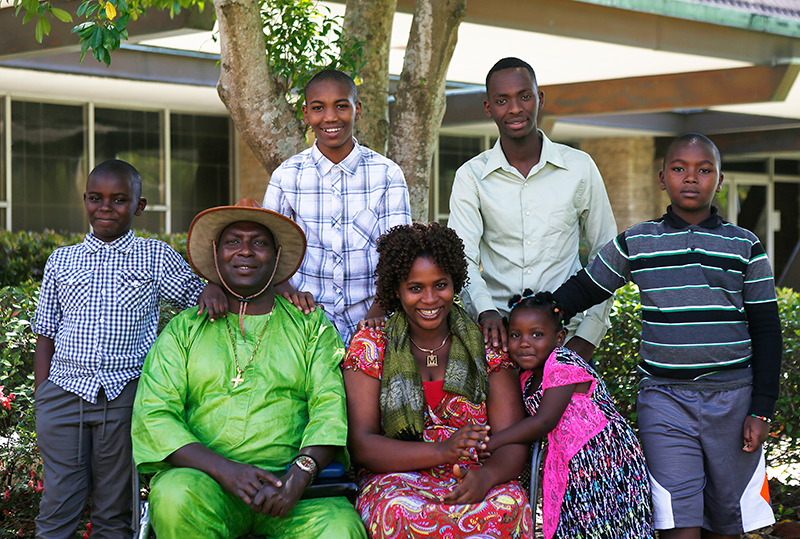 Their family found community among other African refugees in Houston. They were settled in the same apartment complex as Nusura Mtendamema, who attended Westbury United Methodist Church. She told Grace about the church and assured her that the Mukanya family would be welcome there. Grace came first with one or two of the children, getting a ride from church members. Soon, she brought her husband as well. Moise Mukanya, seated, with his family: his wife, Grace, center; his daughter Rehabu; and four of his sons, from left, Famille, Sebantu, Vianney and Mwungura. (His oldest son, Jeune, is not pictured). They have come back ever since, Mukanya said, because the church shows them love -- through handshakes and smiles and hugs, and through Westbury associate pastor Hannah Terry’s visits to their apartment. On Sunday mornings, they join a Sunday school class at Westbury held partly in their native language, Kinyarwanda. On Sunday evenings, their sons play Frisbee and volleyball with the young adult group at a nearby park. On the last Sunday before Christmas, the class studied Luke 1, in which a visitor is joyfully welcomed -- the story of Mary’s visit with Elizabeth. In Kinyarwanda, the word for “visit” is “gusura,” calling to mind in a serendipitous rhyme Nusura, the friend who first welcomed the family to the congregation. After church that Sunday, in a small Sunday school room on the church’s second floor, Mukanya offered a Christmas prayer. His voice was deep and strong, and his words flowed easily -- the words of a man who is used to praying out loud. 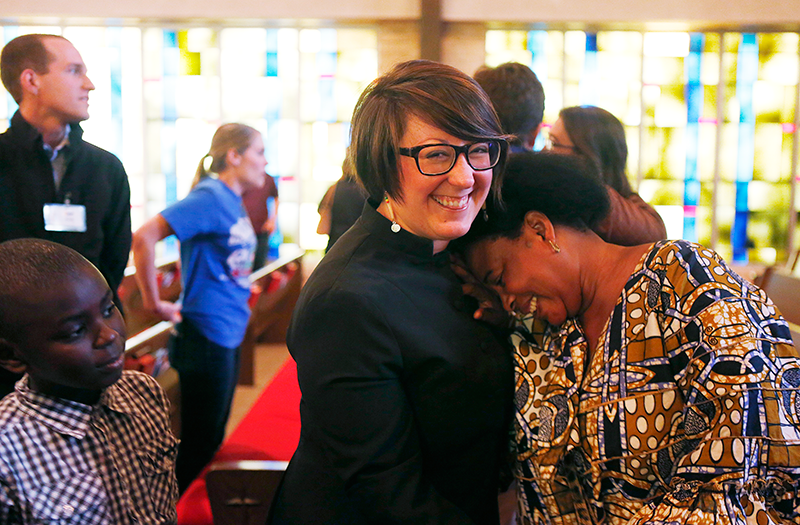 Nusura Mtendamema doesn’t speak English fluently, but there are some words she says easily: Bellfort, Fondren, Willowbend -- the names of the streets that connect her southwest Houston apartment complex to her church. Nusura Mtendamema at Westbury UMC. The 40-year-old is used to giving directions to other parishioners when they give her rides to and from church. Once at the apartment complex, she gestures with her hands to guide drivers along the convoluted path from the front gate all the way to her apartment in the back of the byzantine campus. Mtendamema’s apartment is small and simple: three couches gathered around a coffee table and a TV, a small dining table topped with saints’ statues and garlands of artificial flowers, a galley kitchen, a bathroom and a bedroom. The walls in the corner near the kitchen are festooned with bead necklaces, more flower garlands and a string of multicolored Christmas lights. The two-person couches, neatly covered with plaid blankets, look inviting and comfortable. It was on one of those couches that the Fondren Apartment Ministry was launched. Mtendamema had attended Westbury United Methodist Church for more than a year before Hannah Terry joined the staff on June 1, 2012. Mtendamema, a refugee originally from the East African nation of Burundi, had found her way to Westbury when a Congolese friend told her about a church on the route of bus No. 8. Mtendamema didn’t understand the sermon or the English liturgy, but she liked the songs and the feel of the boisterous congregation. Though she grew up Catholic, there was something about this Methodist church that led her to return. She had other options for worship; the county that includes Houston has more than a million immigrants, and there are churches that worship in just about every language imaginable. But after Mtendamema’s third visit to the church, members with cars started giving her rides to and from worship, and now she’s at Westbury almost every Sunday, sitting in a pew in the back-right quadrant of the sanctuary. Within weeks of Terry’s arrival, the Rev. Tommy Williams, the senior pastor at that time, suggested she get to know Mtendamema. Mtendamema had connected with African church members, but Williams knew little about her except for the sad and solemn countenance she exhibited every week in the pews. Terry stumbled through an introduction and asked Mtendamema whether she could visit with her at home. So one Monday morning in June 2012, Mtendamema welcomed Terry to her apartment. Terry came bearing brownies, raspberries and a smartphone with the Google Translate app. Mtendamema told Terry her story. She was born in a suburb of Bujumbura, the capital of Burundi. When ethnic violence between Hutus and Tutsis broke out across the region in 1994, including the genocide in neighboring Rwanda, Mtendamema lost siblings, many members of her extended family and two of her children. Her daughter Francoise and her son, Claude, were both killed. Her surviving daughter stayed with Mtendamema’s brother in the countryside while Mtendamema fled to Tanzania, where she spent more than a decade in a refugee camp that had little food and rampant disease. Mtendamema told her story to this new pastor because she seemed friendly and receptive. But the translator app was of little help. Without a real interpreter, Terry said, “I had no idea what she was saying.” But they found a way around that. That language barrier mattered less to Mtendamema than the pastor’s presence. The Rev. Hannah Terry and Nusura Mtendamema after worship at Westbury UMC. Mtendamema was the first refugee church member to connect with Terry and was a key to the genesis of the apartment ministry. She was one of the first links between the Fondren neighborhood’s refugee community and the church. She offered Hannah a window into her life and served as a “gatekeeper” who built trust and brought new people to church. She participated in the church’s ESL program. Today, Mtendamema and Terry share an obvious affection, touching each other’s arms and laughing happily when they see each other. To Mtendamema, a language barrier does not mean that a church cannot make a difference. Today, Mtendamema thanks God for bringing her safely to America and for her job cleaning offices at night, which enables her to pay the rent for her apartment and to take care of herself. Refugees have the right to apply for American citizenship after five years of residency. Mtendamema hopes to become a citizen one day so she can visit Burundi to see her surviving daughter for the first time in 20 years, but the English requirement and the civics exam sometimes seem like insurmountable barriers. In a congregation where jeans would not look out of place on a Sunday morning, Emile Nsengiyumva, 31, stands out in his sports coat and shiny dress shoes. When he stands at the front of Westbury’s sanctuary to introduce the African youth choir he has organized, he seems comfortable before an audience, accustomed to addressing large groups. 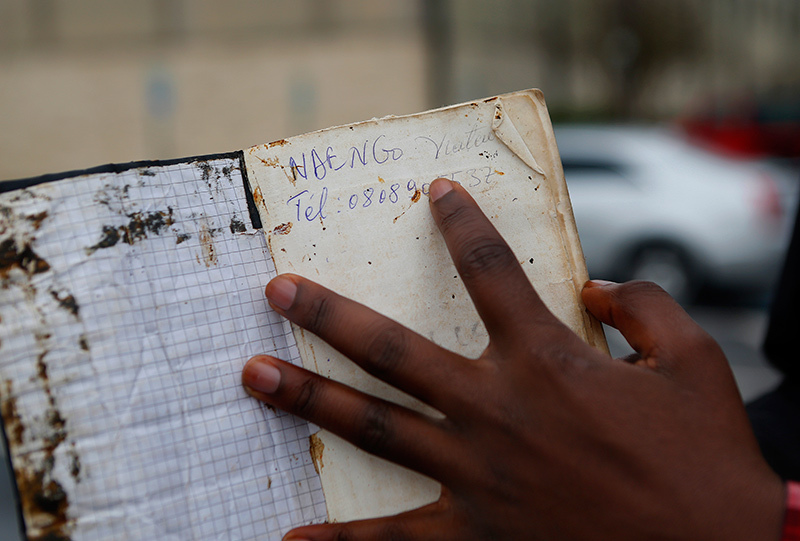 Emile Nsengiyumva holds a French-language Bible he received as a gift and kept through his days in the refugee camp. His father, a cheese-maker, had a hundred cows and could afford to hire others from their town in North Kivu. 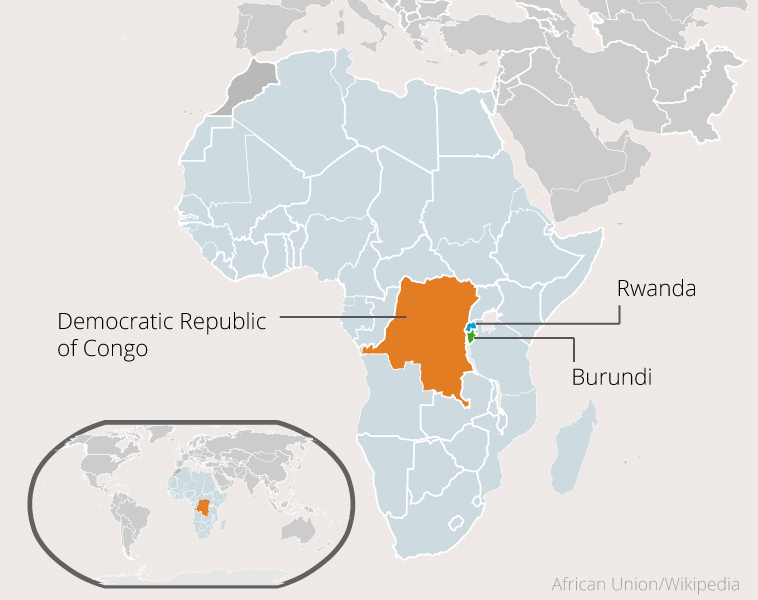 After the 1994 genocide in neighboring Rwanda, the Hutu militias that perpetrated the mass killings escaped across the border into Congo. His family fled in 1996, when Nsengiyumva was 12. In a sad irony, they found shelter in Rwanda, at a hilltop refugee camp called Kiziba. They didn’t leave for 15 years. For a while, they slept on the ground. When the U.N. refugee agency did provide materials for a shelter -- wooden poles, plastic sheeting and mud -- 10 people had to squeeze into a space the size of one bedroom. Nsengiyumva finished primary school in the camp and scored well enough on the final exam to win a spot at a Rwandan boarding school; a charity covered his fees. Though it was a Catholic school, Nsengiyumva said the administration let students organize their own praise choir and choose its leader. The other students chose him. After graduation, he returned to the camp as a primary school teacher, making $45 a month. He was grateful for the job and the purpose it gave him; most camp residents could find no work. In the camp, when he and a friend saw the suffering of elderly people who had no family to care for them, they started a group called Young Christians in Mission. But they did what they could: they delivered cooking supplies, brought firewood and carried water. He was glad to help the less fortunate, but he dreamed of leaving the camp behind. “There was no good thing about life in the camp,” Nsengiyumva said. “The only good thing was resettlement.” After 15 years of waiting, his family’s resettlement application was finally approved. They were assigned a new home: Phoenix, Arizona. When Nsengiyumva, his parents and his brother arrived on Dec. 7, 2011, they enjoyed a warm welcome from the city’s large African community. But the transition was still difficult. The modest federal support dries up quickly; within three to six months, refugees must pay their own way. Yet even with an entrepreneurial spirit, it’s hard to get a job in America with neither English nor Spanish, and it’s hard to learn English in a few months. Nsengiyumva’s boarding school in Rwanda had devoted two hours a week to English, but they didn’t get much farther than “Hi, how are you doing?” Still, Nsengiyumva was determined to succeed. Today, though he wouldn’t be mistaken for a native speaker, his English is fluent. Work was hard to come by in Phoenix, even for those like Nsengiyumva who had English and energy. In March 2015, he left his immediate family and moved to Houston, joining a cousin who promised plentiful jobs. Nsengiyumva shares an apartment with his cousin about four miles north of the Los Arcos complex, where the Fondren Apartment Ministry is centered. He found work with a medical transportation company, driving patients to appointments six days a week. When he first came to Houston, he worshipped at a Congolese church. But the young people from his neighborhood didn’t want to join him there; they told him about another church where they felt loved, with a pastor named Hannah Terry who helped their families. Nsengiyumva quickly got involved with Westbury and has become an informal mentor to the church’s African refugee youth. “He’s a very strong leader in his network,” Terry said. 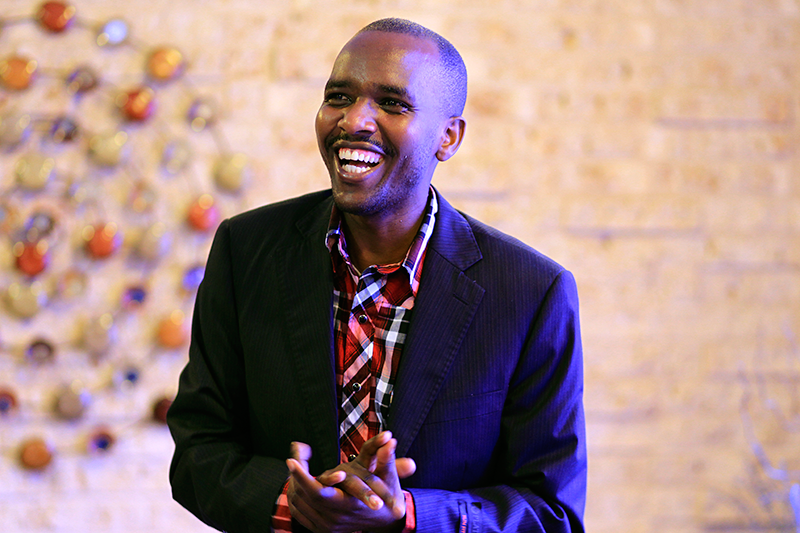 Emile Nsengiyumva is part of a new generation of leaders at Westbury UMC. He organized a youth choir that started rehearsals in September, and by December, Nsengiyumva said, 25 young people had attended. The group has sung several times during Westbury’s Sunday worship, offering multilingual praise that gets the congregation clapping along and has brought new visibility to the church’s refugee community. He wants to focus on African refugees and newcomers, he said, because he understands their culture, their context and their languages. With his knowledge of Swahili, he can speak with most East Africans, and his French allows him to communicate with many West Africans. The organization might lie far in the future, but for now, he does what he can. His cellphone buzzes insistently on this Sunday morning, and he apologetically interrupts his conversation. Translation services for interviews with Nusura Mtendamema and Moise Mukanya were provided by Jeune Ruhumuriza.